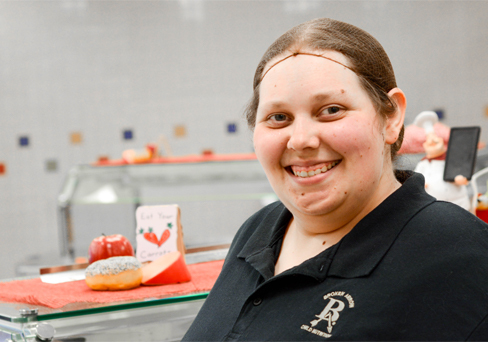 At Broken Arrow Public Schools, Lauren Weir is known for her smile, her loving heart for kids and her work ethic in the Highland Park Elementary cafeteria. Now, she will also be known as one of the winners of the 2018 Governor’s Disability Employment Awards of Excellence. These awards are given each year to outstanding employees with disabilities, to businesses that hire persons with disabilities, and to members of the media or media organizations that publicize these work programs. Weir, who has worked at Highland Park for a little over a year, was nominated by her Gatesway job coach Ana Sapero because of her constant determination and outstanding performance at work. Gatesway is a nonprofit Oklahoma agency that encourages independence and provides opportunities for people with intellectual disabilities. Because of her achievements while at Highland Park Elementary, Weir will be honored at a special ceremony in early October where she will receive a commendation from Governor Mary Fallin.